The days have been getting hotter and hotter as summer time settles in the California valley, and sometimes those nostalgic summer treats I used to enjoy as a kid are just calling my name and begging to be recreated, you feel me? My nieces came over yesterday to hang out and both of them follow a modified paleo diet, so I though it would be perfect to have them help me make some ice cream sandwiches. They helped me make the ice cream, which is made mainly from frozen bananas. I tried to make the ice cream easy enough for them to help me with and they did great! If you are following me on the cool new app Periscope you likely saw us make these together live! If you’re not on Periscope yet, download that baby and hop on there! It’s super fun to watch your fave people on social media broadcast live and chat with them! For the cookie portion, I modified the recipe for my cinnamon raisin cookies I created a few years back and turned them into a chocolate chunk cookie. They turned out SO GOOD!! I need to keep some dough in the freezer on the regular because the cookies alone are AMAZING and I can’t get enough of them! I also made the chocolate chunks from scratch since I don’t really like my store bought options, but to speed up this recipe use something like Enjoy Life Chocolate Chunks/Chips (if you tolerate them) or your fave clean chocolate bar and cut up into chunks. Since my chocolate chunks are homemade and more melty, I try to add them a few minuets before taking the cookies out of the oven. If you would like the recipe for my chocolate chunks, leave me a comment below and I’ll add the recipe on here! So on to what you have been waiting for, the recipe!! Make the ice cream first so it has time to harden (you can make this a day ahead to speed things up). Cut up 3 ripe bananas and freeze them. Place frozen bananas in a food processor and blend for a few mins., scraping down sides as needed. Add coconut/almond milk and blend until it starts to get smooth. FOR CHOCOLATE- Add your cacao powder and blend until really smooth and no chunks remain. Scoop into a freezer safe bowl, cover and freeze for about an hour or until it hardens up and is thick enough to scoop. While you're waiting for your ice cream to set up, make the cookies. In a medium bowl add almond flour, coconut flour, baking soda and salt and mix until combined. In a small bowl add egg, coconut oil, honey, maple syrup and vanilla and whisk together. Add chocolate pieces and gently mix into dough, reserve a few to decorate with later. Roll dough into equal sized balls, about an inch in diameter and flatten them to about 1/2 inch thickness and place on the baking sheet. place in the oven for aprox.12-15 mins. or until the center of cookies are no longer completley soft and have browned on top. Place on a wire rack until cool enough to handle and transfer to the freezer and let harden for about 15-20 mins. 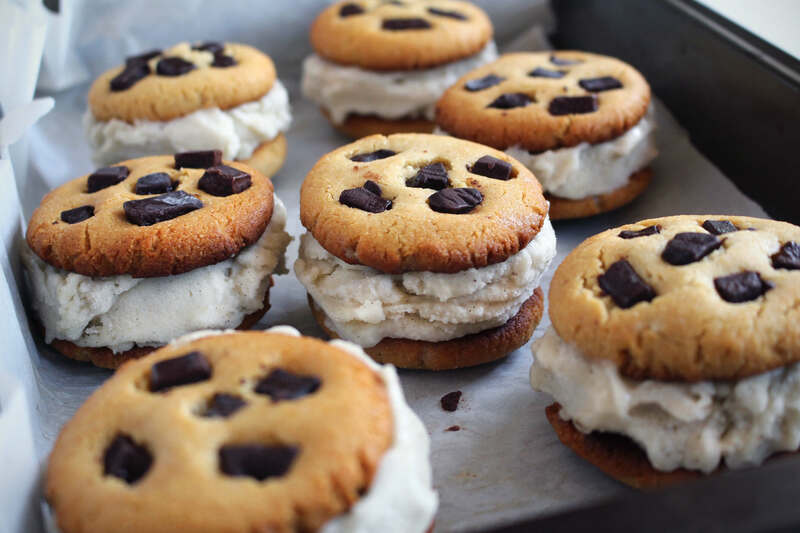 Take cookies and ice cream out of the freezer. 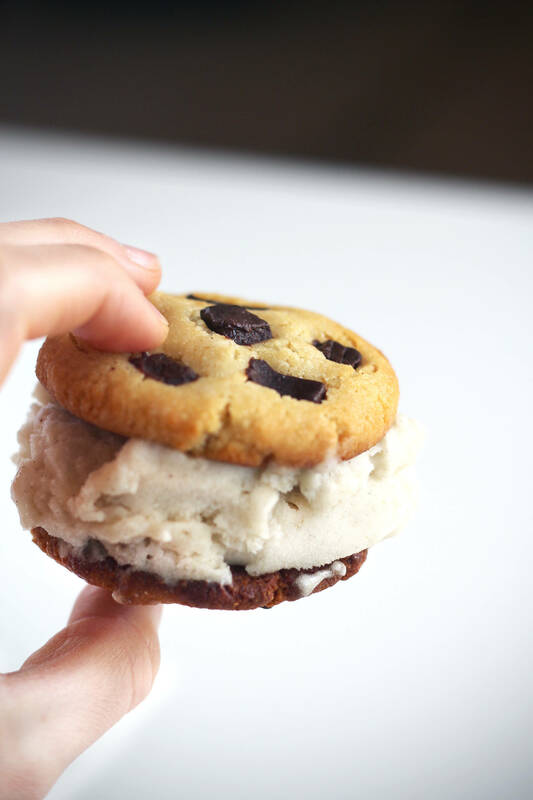 Scoop a good amount of ice cream on to a cookie and top with another cookie. I use my fingers to clean up the edges and smooth them out. Next you can add extra chocolate chunks around the sides if you like a lot of chocolate. You can enjoy them as is, or place them back in the freezer til they harden up and ENJOY! 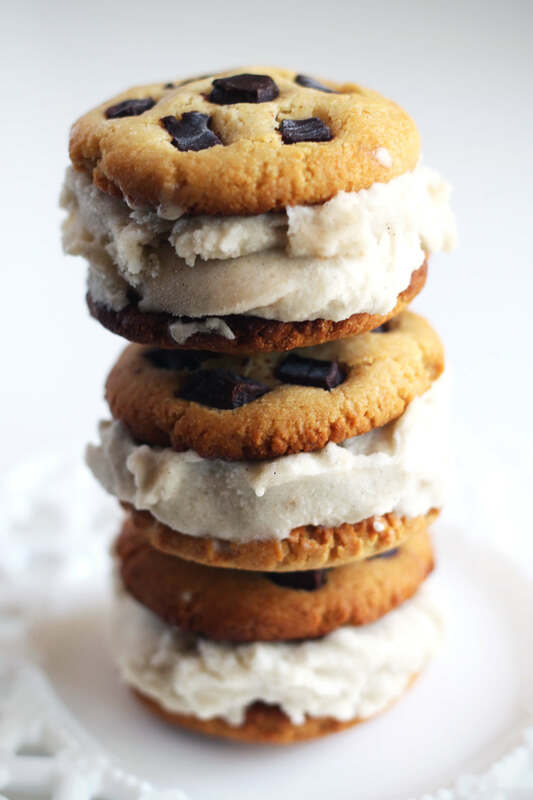 This entry was posted in Desserts, Paleo Dessert and tagged dairyfree, glutenfree, grainfree, icecream sandwich, paleo, paleo dessert, paleo recipes, paleopaparazzi. Bookmark the permalink. Yum! Yum! I want some!! Looks delicious!! Thanks so much! They’re a perfect treat! Amazing!! PLEASE share your chocolate chunks recipe as well. Thank you SO much!! Pingback: The Ultimate Paleo Labor Day Recipes Roundup! - Oh Snap! Let's Eat!